'Manor House', the John Teele Pratt estate designed by Charles A. Platt c. 1909 in Glen Cove. Click HERE and HERE for more on 'Manor House'. 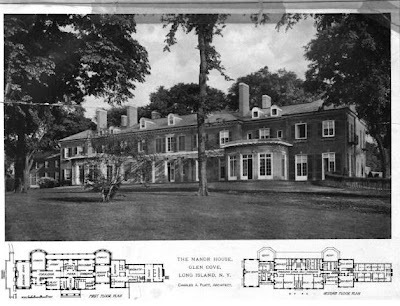 Click HERE to see 'Manor House' on google earth and HERE on bing. Photos from The Brickbuilder, 1912. What is that pole extending out of the house in the third exterior photo? A flagpole? Neo-phlegmaticism at its very best. Yes, that is a flagpole extending from the pediment of the entrance portico. Maybe it is not the most architecturally exciting early 20th century house on Long Island, but it is certainly handsome. 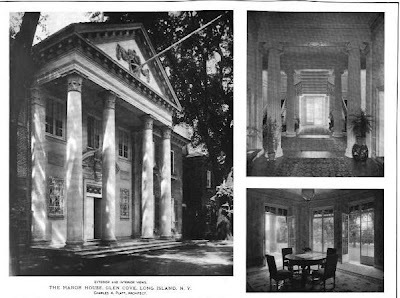 Platt revisited this theme in 1934 for his second house for Mrs. Russell Alger, Jr. in Grosse Pointe. The house is still extant on Voltaire Place between Vendome and Kerby. 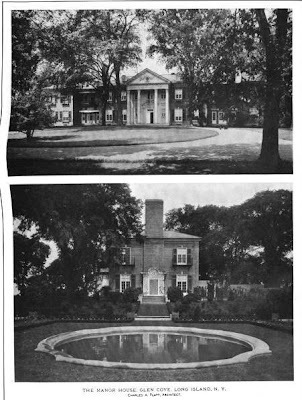 Is everyone aware this was the house Andy Pratt's father, Edwin Baker Pratt, grew up in? Andy Pratt is a rock and roll pioneer. Loved and respected by industry insiders, he is still performing these days off and on in Boston. Director Todd Haynes used Pratt's song "Avenging Annie" in his film "Velvet Goldmine." It doesn't get any cooler than that! And my thanks once again to Zach for this remarkable, wonderful blog. Not to take anything away from Andy Pratt, but he's twenty years too young to be classified as any sort of "rock and roll pioneer." Johnny Burnette. Gene Vincent. Little Richard. Howlin Wolf. Bo Diddley. Jerry Lee Lewis. Etc.